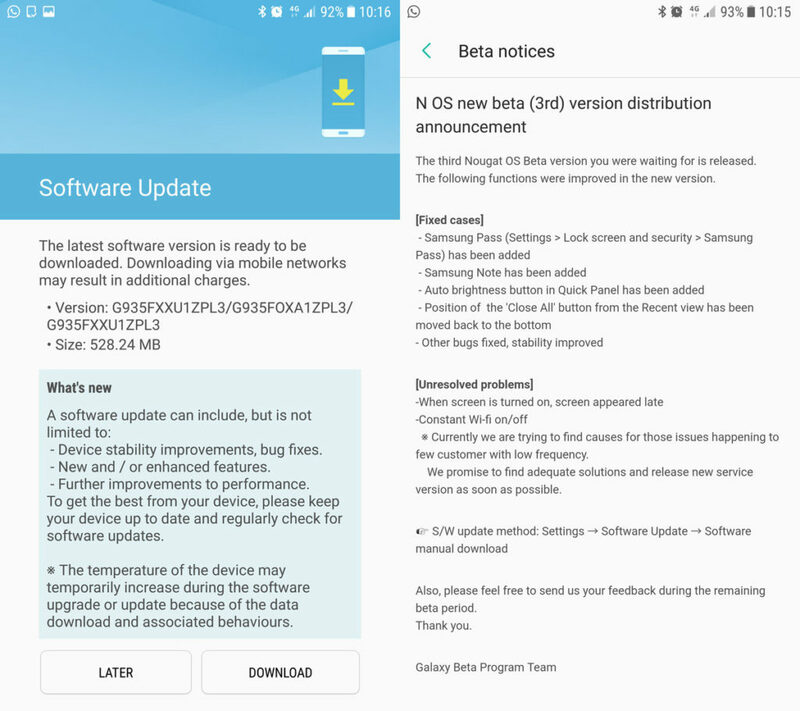 As we know, Samsung has already rolled out the official Android 7.0 Nougat Beta firmware last month. The manufacturer has successfully pushed 3 OTA updates to the Samsung Galaxy S7 and S7 Edge Android phones. Surprisingly, Samsung Mobile has abandoned the name TouchWiz and replaced with new Samsung firmware named Samsung Experience v8 (SE 8). Although based on Android 7.0 Nougat, this is a huge update to the Samsung’s mobile software. The SE 8 brings some new user interface changes and is slowly losing its blue accents. The Nougat Beta 3 firmware brings revamped Statusbar, some UI tweaks and the latest December Security patches. With the new Samsung Experience 8 firmware comes a new Kernel version, new modem, bootloader and much more. Samsung is experimenting heavily with all these new changes to the core system. The firmware build version has been updated to G930FXXU1ZPL3 for Galaxy S7 and G935FXXU1ZPL3 for Galaxy S7 Edge. The OTA weighs around 550 MB. The system dump, however, weighs 1.71 GB. The full Nougat Beta 1 Odin flashable firmware file comes around 2GB. Samsung has stopped releasing the Odin flashable Android 7.0 Nougat firmware files to Samsung Galaxy S7 (Edge) users. The only way to get the latest Beta version onto your device is via OTA updates. However, some S7 users have been able to capture the system dump for the G930FXXU1ZPL3. It may not be usable for the updating your device via Odin software or even TWRP recovery, but it sure will help further development in developing custom ROMS, etc. Update: The adb dump is now available. It includes boot.img, cm.bin, sboot.bin, modem.bin, system.img. Galaxy S7 Nougat apps and features for Galaxy S6, Note 5, etc. How to Install official Galaxy S7 and S7 Edge Android 7.0 Nougat Firmware? This method is for users who are on the stock Android 6.0.1 Marshmallow firmware on Galaxy S7. In order to get the official Nougat Beta OTA notification, you must be on complete stock Android 6.0.1 Marshmallow. See how to restore Galaxy S7 to complete stock. First, you’ll need the Galaxy Beta Program app on your Galaxy S7 or S7 Edge. The app can be downloaded from the Galaxy Apps store. Alternatively, you can also tap this link to get to the download link. Launch the Galaxy Beta Program app. Say “I agree” and click the Agree option. The procedure is simple and applicable to anyone who wants . All you need is download and install the latest Odin software. You will also need the Odin flashable Android 7.0 Nougat Beta 1 G930FXXU1ZPK4 firmware file. You can head over to our previous tutorial on Beta 1 for the firmware file and installation instructions. Once you setup the Beta 1 firmware, all you need to do in hit the Software Updates option in the settings app. Download and install the G935FXXU1ZPL3 OTA. That’s it enjoy Samsung experience 8 on your Galaxy S7. Like and share us on social media. For queries, comment down below. When I click on agree on beta app, the application is denied because the program has reached the limit. Any workaround? Cannot update using the second method since the email should be registered first in the beta program. I downloaded the dump. now what? it doesn’t seem anything I could install using ODIN. any suggestion?